Let’s be honest, colour mixing can be frustrating. You’ve mastered the colour wheel, you understand complementary colours and may have either dabbled with a few different colour schemes but why do you paintings still not work? Why don’t they balance and create harmony to your eye? To understand colour you have to think like a detective, look for the clues and piece sections together. And sometimes the clues can be right under your nose, literally. Have you looked in the mirror this morning? Not for a self portrait, or pencil study but to try to understand your personal relationship with colours. We are often subconsciously drawn towards colours that match and compliment our skin tone. I’m cool. You know, like the Fonz! I also have cool skin tones, pale skin and am drawn to colours that balance with that and are quite muted. I very rarely wear bright red and only use it in a minimal amount in my landscape paintings. Now, of course, this isn’t a exact science, but have a look through the colours in your wardrobe and start to see if any of the colours that pop up in your clothes, pop up in your paintings. Colour is such a personal thing. Artists often go through different periods depending on their emotional state, or sometimes you’ve just tried a new colour for a change and it starts a whole new area of interest. Colour is all about relationships, either warm and cool, harmony and contrast, balance or conflict. Sometimes you will read a recommended palette of colours by an artist, try it yourself at home yet something just doesn’t sit right. It doesn’t ring true for you. You have to experiment to weed out the colours you don’t like and keep the colours you have an affinity with close to hand. A mood board is often used in the design industry to develop a brand, you can use the same techniques on a voyage of self discovery to discover your own colour palette. Step 1. Tear out pictures magazines, copy from a google search, upload photos from your camera. What you need to do is to amass a collection of images ( they don’t have to all be paintings) to start to try and see some common trends. Step 2. layout a collection of your images to create a ‘mood board’ to start to try and see a theme. Some artists favour a sombre palette, so earth colours would be a natural choice, others prefer bright, vivid colours so maybe try some man made quinacridones. Step 3. Try and identify the palettes that you are drawn towards. When painting things are in a state of flux, it really is a matter of personal taste. The palette of colours that you come to use will be like your personal identity, a thumbprint that is uniquely yours, and as Picasso’s palette changed throughout his career, so will yours. At the moment I’m slightly obsessed with Indian red, I love how much it changes when you add white, compared to using it in thin glazes. But I don’t recommend it to my students who are just starting out because the colour jumps can be too much and too unpredictable. Colour is often steeped in emotion, and causes emotional responses in us. Red can be danger or passion and heightens the senses, blue can be calm to some and make others feel restless. Often, when you start painting you are searching for a ‘style’ yet this style can seem obvious to outsiders looking in but allude you for a lot longer. 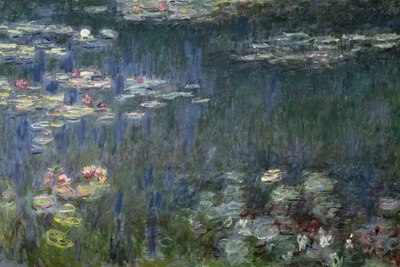 The first artist we are going to look at is Claude Monet. I first really fell in love with Monet on a trip to Paris when I was at art college. I’d always thought his work was ‘nice’ but I didn’t truly appreciate it until I saw it in the flesh, particularly the Water Lilies in the Musée de l’Orangerie, Paris. It was a chilly morning on the street of Paris and I’d just had my morning croissant and expresso and was ticking off the gallery list. I wandered into the next gallery on my list and wasn’t expecting much…. and then I turned the corner into the room. The first thing that hits you is the scale. I sat down and became fully immersed in the picture. When viewing the paintings up close you notice the rapid brushstrokes and array of colours yet step back, take a seat and relax and you melt into them. The view encompasses you and you have a real feeling of inner calm. You feel as if you are sitting next to Monet painting the scene. But how do you create this deep connection in your own works? Now the atmosphere of the gallery and the aura of the piece certainly helps but what about the colours he used. How did they effect my emotional reaction? And how can you adapt his techniques to help in your own paintings. The first thing that Monet uses is the effect of broken colour. The broken colours are very close in tone, so there isn’t a very big visual shift for your eye. It is this technique that makes it so harmonious as a painting. So next time you’re half way through a painting and you’ve just added a stroke of colour in the sky, try to use that exact same colour somewhere in the foreground and visa versa. This will help the viewers eye to dance around the painting. Monet also draws our focus to the front of the painting both by the use of contrast and the use of the strong bright blue. Notice how he uses what I call the ‘trickle effect,’ imagine pouring some water from the top of your canvas and the water flows wherever the light falls. Monet has used strokes of a darker blue to ‘trickle’ light towards the foreground, again creating movement. Look carefully on the lefthand side to see a subtle triangle of darker blue. This is another method of adding harmony by distributing the same colour, dark blue throughout the piece. If you ever get the chance to visit Paris, I highly recommend a Monet moment and don’t forget the croissant! Have you got any tips for creating the Monet effect? What’s your colour palette at the moment? About the Author Will Kemp can teach you how to draw & paint. He is shortly starting a new online drawing course for absolute beginners.